A classic horror comic published by Marvel predecessor Atlas Comics. It ran form 1951 till 1954 for 31 issues. 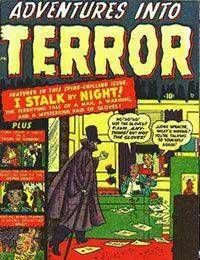 This series is continued from Adventures into Terror (1950) which had issue 1 and 2 in it (strangely numbered as issue 43 and 44).<br />Note: In contradiction to current times, publishers sometimes used a higher numbering then it actually was, or would continue the numbering of a previous series as it was the notion back then that comics with a higher number stood for long lasting quality and better sales, hence that issue 1 and 2 of the previous series are likely numbered with 43 and 44.